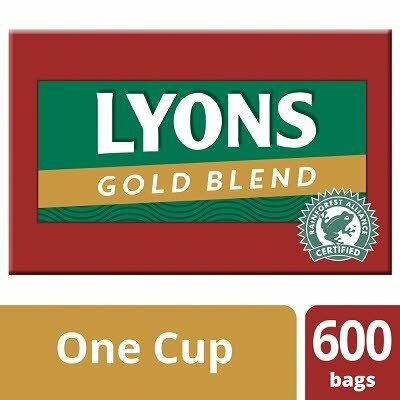 Lyons Gold Blend 600 Tea Bags offers a rich tasting blend serving 600 cups of tea a pack. Our gold blend is a robust, bold and fully rounded tea that embodies the deepest flavours from the world’s lushest tea gardens. We use our finest Kenyan, Assam and Ceylon tea leaves to create this intense and rich tea. All the delicious leaves used in blending this Lyons tea are 100% sustainably sourced & Rainforest Alliance Certified™. 1) Place one pyramid tea bag per person into a pre-heated cup or teapot. 2) Using freshly boiled water, allow to infuse for 2-3 minutes (or brew according to taste). 3) Stir and remove the tea bag. 4) Enjoy your cup of Lyons Tea.